Our year was marked by continued work on two major policy areas: health care for kids and early childhood care and education. Our work on high-quality early childhood learning centered on a push for an adequate, sustainable source of funding so that programs and services for children from birth to age five could be greatly expanded across the state. In the previous year, we worked in coalition with numerous allies through the Invest in Kids Now! campaign to educate legislators and the public about the value of such programs in improving educational and economic outcomes. We saw those efforts paying off as more and more positive references to early childhood programs appeared in the news and social media. However, funding continued to be sorely lacking. New Mexico does have home visiting (parent coaching), high-quality child care, and effective pre-kindergarten programs, but the lack of state funding means these services reach just a tiny fraction of the children who would most benefit. As we had in the previous year, we continued to advocate for funding from the state’s $10 billion Land Grant Permanent Fund. On the health care front, we continued to work on getting the state to enroll more eligible kids in Medicaid. This was very important as state funding to conduct outreach to eligible but un-enrolled kids had been cut and Governor Martinez’s administration called the state’s Medicaid program “unsustainable.” Costs, the administration said, were out-of-control and would only get worse. For this reason, the Governor directed the Human Services Department to undertake a “redesign” of New Mexico’s Medicaid program. Fearing that the redesign would lead to cuts in benefits or “cost sharing” (co-pays for patients)—or both—we worked extensively with our health care partners through the Medicaid Coalition (which we convene) and Health Care for All. We met with the redesign consultant and the state’s Human Services Department, gave input at public meetings, and worked with the federal office that administers Medicaid. The redesign proposal, released in February 2012, had no reductions in eligibility, benefits or provider reimbursements, and the cost-sharing provisions were minimal. Advocating for full implementation of the Affordable Care Act was also high on our health care agenda. Many state governors were taking a wait-and-see attitude toward ObamaCare in the run-up to the 2012 general election. New Mexico, however, was moving forward on one of the primary provisions in the Act—the creation of a state health insurance exchange, a virtual marketplace where those without insurance can compare plans and find out if they qualify for tax credits. One of our main concerns was that the exchange would be run by the insurance companies and would not, therefore, negotiate for the best plans on behalf of consumers. To address this and other concerns, we were actively involved in the early exchange creation process. As a result of that involvement, one of our policy staff members was appointed to the Exchange Advisory Task Force. On June 28, 2012, just as our fiscal year was coming to a close, the U.S. Supreme Court ruled that the Affordable Care Act was constitutional but that the federal government could not punish states for not implementing the Medicaid expansion provision by pulling funding for their current Medicaid programs. In essence, this made Medicaid expansion optional for states. Based on past evidence, we believe the Medicaid expansion is critical for getting more children enrolled in Medicaid, even though the expansion only covers low-income adults. The most common reason parents do not enroll their eligible kids in Medicaid is that they are unaware that no-cost or low-cost health insurance is available to their children. Since adults will be compelled to find their own insurance under ObamaCare, low-income parents will discover that their children qualify as well. On a more personal note, in October of 2011, just four months into our fiscal year, Executive Director Eric Griego stepped down to run for New Mexico’s District 1 congressional seat. Veronica C. García, Ed.D., best known for her tenure as the state’s first Secretary of Education, took the NM Voices’ helm in June 2012, just as the fiscal year was drawing to a close. It is rare that new public policies are passed into law in the course of one year. Generally, advocates spend a few years educating lawmakers and the public about the need for and purpose of proposed legislation. Even then, it can take several years before the policy will make its way through the committee process and to the floor of both legislative chambers for a vote. Then, even if passed, there is always the possibility that the governor will veto it. The 2012 legislative session marked the second year we advocated for more funding for early childhood care and learning programs through the Land Grant Permanent Fund. In order for that to happen, the Legislature would first have to pass a joint resolution that would put a question on the ballot, allowing voters to amend the state constitution. This year the resolution had a great deal more support behind it, and we had more success in moving toward our goal than in the previous session. Ultimately, however, the resolution did not have enough support by key legislators. The resolution passed its first two committee hearings but was tabled in the Senate Finance Committee. Along with our allies, we consider this to be major progress, because the chair of the Senate Finance Committee had refused to even schedule a hearing for the bill in the previous year. Although we did not see the resolution make it to the floor of either chamber for a vote, we were successful in raising the visibility of the issue to an even greater extent within the news media and public debate. We had more success with two other public policies for which we’ve been advocating for several years. Our legislative sponsor finally succeeded in getting mandatory combined reporting legislation passed. This bill would close a tax loophole that some multi-state corporations exploit to shirk their tax responsibility to the people of New Mexico. We also saw the passage of a bill requiring that the state produce an annual tax expenditure budget. These budgets, which are routine in most other states, tally up the combined cost of all the tax cuts, exemptions, and deductions that lawmakers have enacted over the years. A good tax expenditure budget also considers the effectiveness of the tax breaks to determine whether they produced the intended economic effect. Unfortunately, both of these bills were vetoed by the Governor. We were also asked to assist a coalition with the research and analysis needed to organize around the issue of raising the minimum wage statewide and indexing it to inflation. That legislation did not pass, but we joined that coalition again later in the year to help with a ballot initiative to raise and index the wage in Albuquerque for the November 2012 election. This was passed by voters with a two-to-one margin. Part of our legislative advocacy work is focused on defeating public policies that will hurt children and working families. Often these policies are regressive taxes, which fall hardest on the poor, or tax cuts that don’t spur the economy but siphon money away from priorities like education and public safety. For example, a proposal that would allow corporations to use the Single Sales Factor Formula in determining their state income taxes had been widely discussed. Research from the Center on Budget and Policy Priorities has shown that the Single Sales Factor would dramatically cut corporate taxes but would not create jobs. In our cautionary report, Winner and Losers: The Single Sales Factor Formula in New Mexico, we pointed out that the bill would take about $250 million in revenue out of the state budget every year. Armed with our research and working with the New Mexico Fairness Project, a coalition of 37 organizations that we lead, we were successful in helping defeating that legislation. We also worked with the Native American Voter’s Alliance to help defeat Voter ID legislation, which is known to disenfranchise voters who are low income, minority, elderly or veterans. Such laws are solutions in search of problems, since voter fraud is extremely rare, as we pointed out in our report, Analysis: Voter Photo ID Laws are Costly. Early in the fiscal year we updated our two reports on how ObamaCare would help New Mexico’s economy and state budget. These reports, The Economic Benefits of Health Care Reform in New Mexico and The Tax Revenue Benefits of Health Care Reform in New Mexico, would later prove instrumental in changing the public dialog around Medicaid from a program that was financially “unsustainable” to one that brings economic benefits. The Great Recession—and the resulting cuts in state spending—prompted several reports. We produced Funding Public Schools in New Mexico in the Great Recession about the need to raise new revenue for K-12 schools to return our teacher-student ratios to appropriate levels. Aside from issues of college affordability, Higher Education Expenditures and College Affordability in New Mexico, released through the Working Poor Families Project, looked at the severe decline in the Lottery Scholarship Trust Fund due to tuition increases brought about by state funding cuts. Similarly, the state’s Unemployment Insurance Trust Fund, which pays benefits to those who have been laid off, was dropping to dangerously low levels. Our report, The Need to Strengthen New Mexico’s Unemployment Trust Fund, looked at how legislatively enacted rate cuts for employers had put the fund in trouble. We also looked at how cuts in benefits—put in place to help offset employer rate cuts—had put unemployed New Mexicans and their families in jeopardy. Our Indexing the State Minimum Wage to Inflation report was released as part of a coalition effort during the 2012 legislative session to raise the minimum wage statewide and index it to inflation. Along with making the economic case for raising and indexing the wage, this report described the demographics of the population that would be affected. Overwhelmingly they are adults working more than part-time jobs, Hispanic, and women—meaning minimum wage earners are likely to be parents and/or sole breadwinners. As we do every year, we released our annual New Mexico KIDS COUNT Data Report at the start of the 2012 legislative session. This report is a profile of the well-being of New Mexico’s children, highlighting indicators such as family economic security, parental employment levels, hunger, teen birth rates, and the like. We release it at the start of the legislative session so it can help focus the debate around state spending and revenue on how these policies impact children and their families. 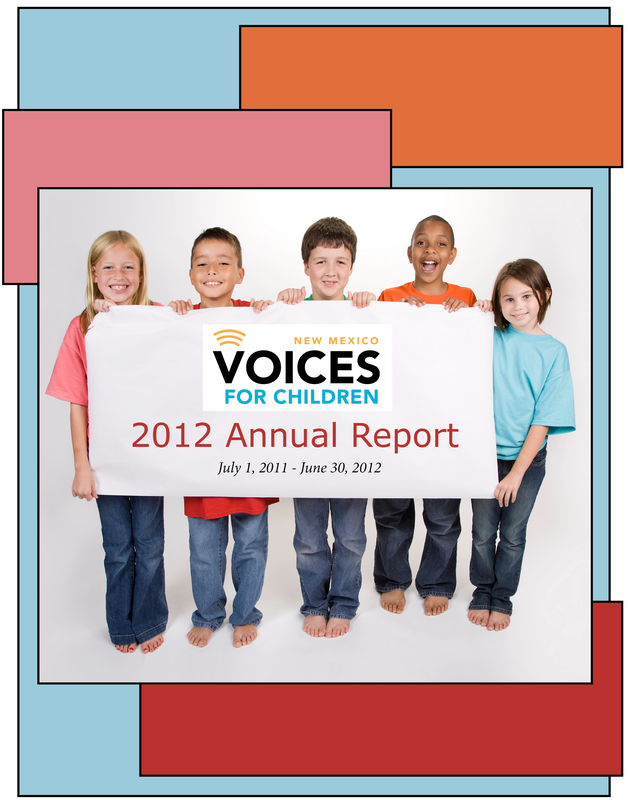 Along with our annual KIDS COUNT report, we also typically release one or two special reports or data snapshots. This year, with the special assistance of ENLACE (Engaging Latino Communities for Education), we produced the report Immigration Matters in New Mexico: How KIDS COUNT. ENLACE provided us with interviews of their staff members about their experiences both as immigrants and as advocates for other immigrants. We also had the community brief translated into Spanish—a first for us. Since fiscal year 2012 included a general election, we produced an educational Vote for Kids! guide. This short, easy-to-read guide summed up issues of importance to children and families that we encouraged people to consider during the election season. These included economic issues, such as raising the minimum wage, as elements key to the economic success for families. We published a Spanish version of this guide, which was very useful to outreach groups working within the Spanish-speaking community. We made our annual awards and fundraising event a family-friendly affair by holding it at the Albuquerque Bio Park. At the annual Spirit of Hope Celebration, kids were treated to face painting, a visit from Isotopes’ mascot Orbit, and extended viewing of zoo exhibits. As we do every year, we honored several individuals with awards. Kara Bobroff of Corrales, founder and principal of the Native American Community Academy (NACA), received the Alice King Public Service Award. Anna Nelson of Albuquerque, Executive Director of the New Mexico Forum for Youth in Community, was given the Patty Jennings and Polly Arango Citizen Advocacy Award. The Amy Biehl Youth Spirit Award went to Marcella Gurule-Sandoval of Santa Cruz, a UNM College and Student Relations fellow for the Hispanic College Fund and New Mexico Hispanic Youth Institute, and Cesar Miranda of Pajarito Mesa, a volunteer with the Pajarito Mesa Community Organization. We also honored long-time Board Chair Nancy Jo Archer.